It should come as no surprise that the protestors in Ferguson, Missouri should discover a mutually beneficial relationship with the Palestinian Liberation movement. Those in Ferguson, who see the death of Michael Brown as unjustified and the result of tyranny by an iron-fisted police force, are finding a symbiosis with Palestinian nationalists who see themselves as suffering under Israeli occupation. But how much of this kinship is intrinsically recognized, and how much is promoted and encouraged? When considering racially charged Ferguson, and anti-Israel Palestine, what are the similarities that the Religious Left (didn't know they existed, did you?) can exploit? The answer in one word -- it is called OPPRESSION. First, let's identify the Religious Left. This is much more difficult to do than defining the Religious Right. The Leftist version is described on Wikipedia as referring to a spectrum of left-wing Christian (?) political and social movements that largely embrace viewpoints described as social justice that upholds a social gospel. I question the Christian aspect of their movement, because they often do not believe in the infallibility or veracity of the Bible. Their interpretation of "social justice" is based on the collective; i.e., justice in terms of the distribution of wealth, opportunities, and privileges within a society. I contend that the Biblical meaning of "social justice" is more individual than societal; Jesus commands each of us to take care of the poor, the widows, and the fatherless. The Bible places the responsibility on the individual to show kindness and mercy, rather than on the government to force income equality through increased taxes and redistribution. Obviously, one approach is God-centered; the other is man-centered. Now that we have the definitions and explanations out of the way, what does all this have to do with Ferguson and Palestine? Well, it seems that the Religious Left includes organizations like the Quaker group, American Friends Service Committee (AFSC). 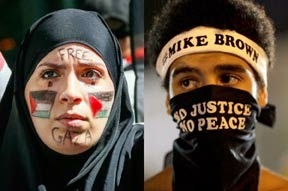 They have become a political force that has involved itself in causes they deem "oppressive" to the spirit of "peace." To wit, they welcomed a blog post on their website from a Palestinian who has become embroiled in the Ferguson protests. Bassem Masri felt the same dismissal by mainstream Americans toward the plight of Ferguson citizens, as he has in Americans' repudiation of the Palestinian cause. He wrote, "The timing of the two events woke up a lot of people. When Mike was killed, much of the media started demonizing him and the protestors, often the same sources that blamed Palestinians for their own deaths in Gaza. People naturally saw the connections." Oh, really? While admitting that I am nervous about seeing the militarization of police, I am also not willing to declare either Michael Brown, the destructive citizens of Ferguson, or the anti-Israeli Palestinians as "innocent" victims of tyranny. I am not sitting on the Ferguson Grand Jury, and therefore I do not have all the evidence, but by all appearances, this will not be a slam-dunk indictment of Officer Darren Wilson. Neither are the citizens of Ferguson without fault. Those who chose to rob businesses, destroy private property, and assault law enforcement officers should not expect sympathy for their actions. I'm sorry, but I reject the premise of Mr. Masri, and groups like the AFSC, that Ferguson rioters and Palestinian nationalists are fellow "resistance fighters". And I resent the race card being played as a method of pointing out "human rights abuses" in Ferguson. It is a clear attempt to create a common identity between these two disparate groups. By endorsing Masri's post and self-proclaimed role as "collaborator" with the Ferguson protestors, AFSC shows their true colors: to proclaim the moral and social tyranny of America and Israel. 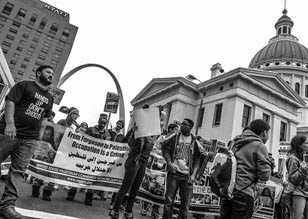 Masri stokes the fire, as he writes, "Facing violence from an occupying force, whether in Palestine or Ferguson, forges a mindset that demands resistance and standing up for one’s community. When the police used military tanks and checkpoints to imprison the residents of Ferguson, I was reminded of life in the West Bank where I saw the Israeli military use the same tactics of repression." Ah, not only is his bias showing, but his own bigotry and political leanings. Sadly, I am afraid that Ferguson is ripe for such exploitation. I used to live near St. Louis during my high school years, and I can tell you that the ensuing years of government entitlement have led to this powder keg situation. Generations of fatherless kids and welfare families, along with a willingness to write off these communities, have created two Americas that will not easily be reconciled. The racial tension is so palpable you can touch it; the economic divide seems insurmountable. No one seems to know how to avoid the coming firestorm. And into the fray, step outside groups who are organized, and only too willing to capitalize on the mounting pressure; groups who threaten to usurp the cause of the Ferguson residents for their own agendas. They don't even know they are being used. So, now the Grand Jury verdict is due any day now. What will be the ramifications? And who will ultimately benefit from the expected chaos? It seems clear to me that Ferguson is positioned to become the battle ground between anarchy and authoritarianism ... and who will be the victor? Either way, America loses. For more on the views of Mr. Masri and the American Friends Service Committee, click here. Psalm 7:8 "The Lord judges the peoples; judge me, O Lord, according to my righteousness and according to the integrity that is in me." 88 year old WWII veteran, Delbert Belton, was beaten to death in his vehicle in a parking lot in August, 2013, in Spokane, WA where I live. They caught the two 16 year old black kids (with previous assault charges to their credit) but where is the justice? This case hasn't been mentioned in the press since December 2013, that I can find. I expect no justice for this white police officer in Missouri, if he was defending himself. I also imagine that the people serving on the grand jury are in danger. This situation will indeed blow up, according to a dream that someone was given, and will kick off a very bloody revolution in this country. Churches are said to be now active in Ferguson, praying and trying to diffuse the situation. Everyone must do spiritual warfare for the people of Ferguson. Yes! This is definitely spiritual warfare, and we CAN diffuse the hatred and evil, if we get down on our knees. The demonic forces in Ferguson are no match for the powers in Heaven. Intercessory prayer is the answer! The powder keg ready to explode in Ferguson is everywhere.... Remember they thought that good was evil and evil was good. There is a message in this video, and it could VERY WELL be a parallel between Israel/Ferguson PD. At the end of the video, he will explain HOW.